9 Commonwealth is located on the north side of Commonwealth, between Arlington and Berkeley, with 7 Commonwealth to the east and 11 Commonwealth to the west. 9 Commonwealth was built ca. 1861, one of two houses (7-9 Commonwealth) built at the same time in a symmetrical design, each with a bay extending through the mansard roof. 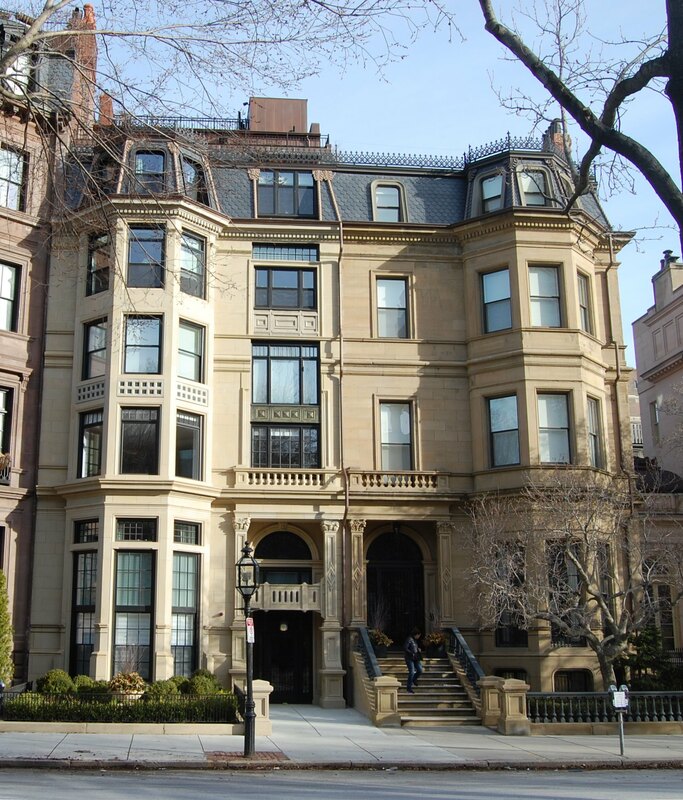 9 Commonwealth was built as the home of Richard Cranch Greenleaf and his wife, Mary (Whitney) Greenleaf, and 7 Commonwealth was built as the home of Samuel Johnson, Jr., and his wife, Mary (Stoddard) Johnson. Richard Greenleaf and Samuel Johnson were partners in the wholesale dry goods firm of C. F. Hovey & Co. Both men purchased the land on which the houses were built from merchant and banker Samuel Gray Ward on December 22, 1860. He and his wife, Anna Hazard (Barker) Ward, lived at 1 Commonwealth. He had purchased the land from the Commonwealth of Massachusetts on May 2, 1860. Click here for an index to the deeds for 9 Commonwealth. In 1860, the Greenleafs had lived in Jamaica Plain. Their son, Richard Cranch Greenlead, Jr., lived with him. He was a physician. He married in June of 1870 to Adeline Emma Stone. After their marriage, they moved to 30 Newbury. When 9 Commonwealth was built, the western party wall was located entirely on Richard Greenleaf’s land (rather than half on his property and half on the lot to the west, which was the usual practice). On December 4, 1867, as Frederick Bradlee was preparing to have a house built at 11 Commonwealth, Richard Greenleaf sold him a strip of land six inches wide and 103.5 feet long, “commencing at a point one foot back from the face line of my building and extending to the rear passageway,” so that Frederick Bradlee would own one half of the party wall between 9 and 11 Commonwealth. 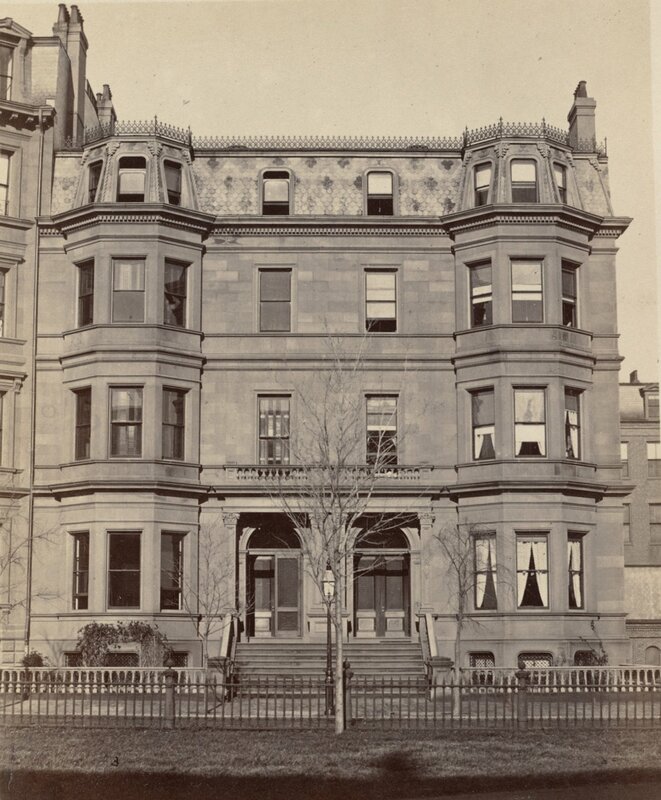 Richard and Mary Greenleaf continued to live at 9 Commonwealth in 1870, but moved thereafter to 28 Newbury, next door to their son and daughter-in-law. On November 16, 1870, 9 Commonwealth was purchased from Richard Greenleaf by Otis Norcross. He and his wife, Lucy (Lane) Norcross, made it their home. They previously had lived at 10 McLean. Otis Norcross was an importer and dealer in crockery. He served as Mayor of Boston in 1867. The Norcross’s four children lived with them: Otis Norcross, Jr., Addison Norcross, Laura Norcross, and Grenville Howland Norcross. Addison Norcross died in October of 1873. Otis Norcross, Jr., an attorney, married in January of 1881 to Susannah Ruggles Plympton. After their marriage, they lived at 249 Marlborough. Otis Norcross, Sr., died in September of 1882. Lucy Norcross continued to live at 9 Commonwealth with their unmarried children, Laura and Grenville. Grenville Norcross was an attorney in partnership with his brother, Otis. Laura Norcross married in December of 1896 to William D. Kingsmill Marrs (called Kingsmill Marrs), a banker. After their marriage, they lived at South Park in Wayland and at Maitland Cottage in Maitland, Florida. 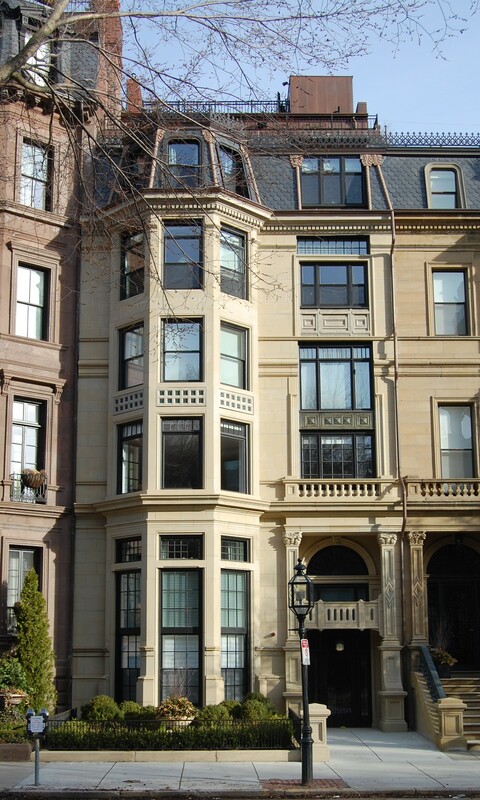 On May 20, 1910, Wolcott Johnson entered into a party wall agreement with the estate of Otis Norcross, owners of 9 Commonwealth. Lucy Norcross died in February of 1916. Grenville Norcross remained unmarried and continued to live at 9 Commonwealth. By 1920 (and probably from about the time of Lucy Norcross’s death) he was joined by his widowed sister, Laura (Norcross) Marrs, whose husband had died in 1912 in Florence. She continued to live at 9 Commonwealth until her death in 1926. During the 1928-1929 winter season, Grenville Norcross was living elsewhere and 9 Commonwealth was the home of Mrs. Anna (Clapp) Frothingham, the widow of Paul Revere Frothingham. She was the sister-in-law of Mary Shreve (Ames) Frothingham, widow of Louis Adams Frothingham, who moved to 7 Commonwealth at about that time. By the 1929-1930 winter season, 9 Commonwealth was once again the home of Grenville Norcross. He continued to live there until his death February of 1937. On September 15, 1937, 7 Commonwealth was purchased from Otis Norcross’s estate by the Newbury Realty Company. 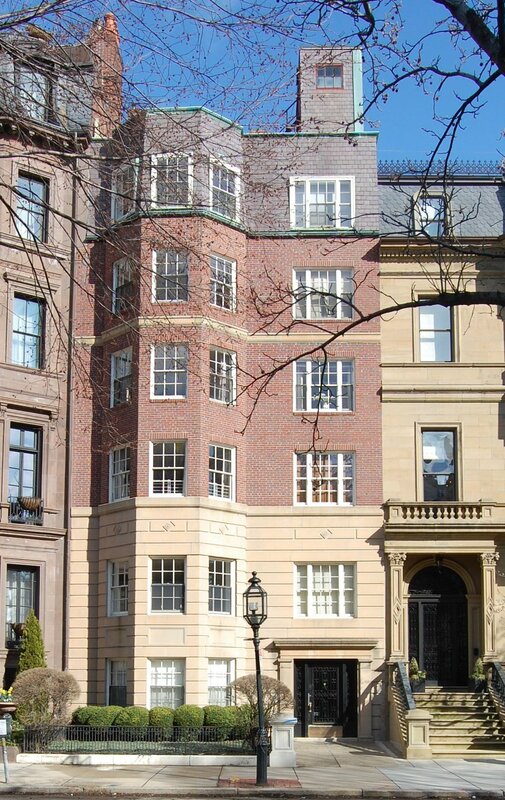 In October of 1937, Newbury Realty applied for (and subsequently received) permission to convert the house into a 13-unit apartment building, significantly remodeling both the interior and exterior, including lowering the front entrance to sidewalk level and adding two stories within approximately the same building height by relocating the floors. The permit records do not include the name of the architect who designed the remodeling. On August 28, 1993, Newbury Realty transferred 9 Commonwealth to Pythia Realty, Inc. Noreen Hall Papatheodorou of Florida was president of both companies. 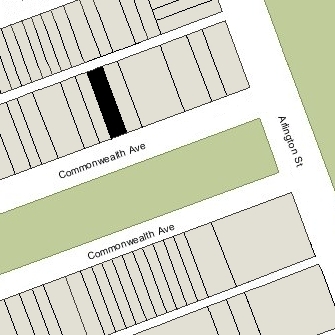 9 Commonwealth remained a thirteen unit apartment house. In November of 2013, Pythia Realty, Inc., applied for (and subsequently received) permission to significantly remodel the property, modifying the front façade in a manner sympathetic to the original design and companion building at 7 Commonwealth (while retaining the extra stories added in 1937), installing an interior garage, and reducing the number of units from thirteen to five. The remodeling was designed by architects Meyer and Meyer. On November 18, 2013, 9 Commonwealth was purchased from Pythia Realty by the Nine Commonwealth LLC (Kevin Ahearn, Michael Durand, Salvatore Campo Franco, and Greg Caggainello, managers of record). In January of 2015, Nine Commonwealth LLC received permission to increase the number of units from five to six, and on July 29, 2015, it converted the property into six condominium units, the Nine Commonwealth Avenue Condominium. 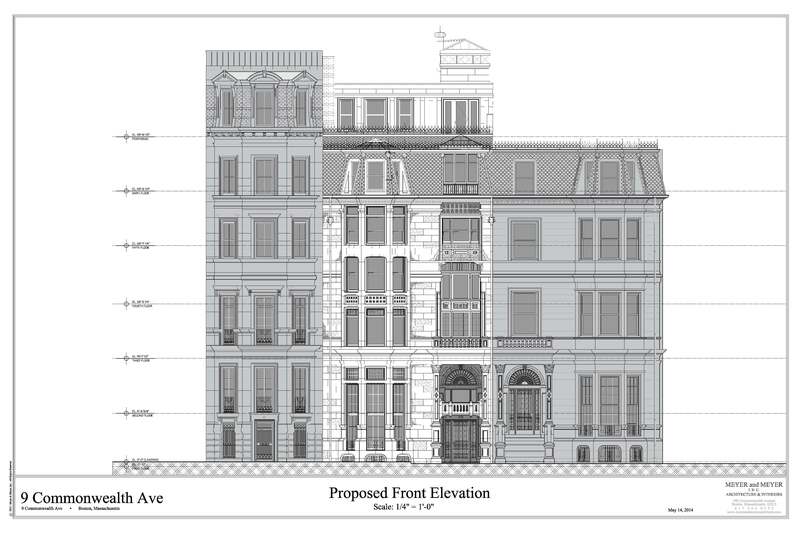 Below are architectural renderings of the front façades of 9 Commonwealth and the abutting buildings as they appeared in May of 2014 (showing 9 Commonwealth as remodeled in 1937), and the proposed front façade of 9 Commonwealth, subsequently approved by the Back Bay Architectural Commission and constructed in 2014-2015, courtesy of architects Meyer and Meyer, Inc.
Front façade of 9 Commonwealth as it existed in 2014, showing abutting buildings, May2014; courtesy of Meyer and Meyer, Inc. 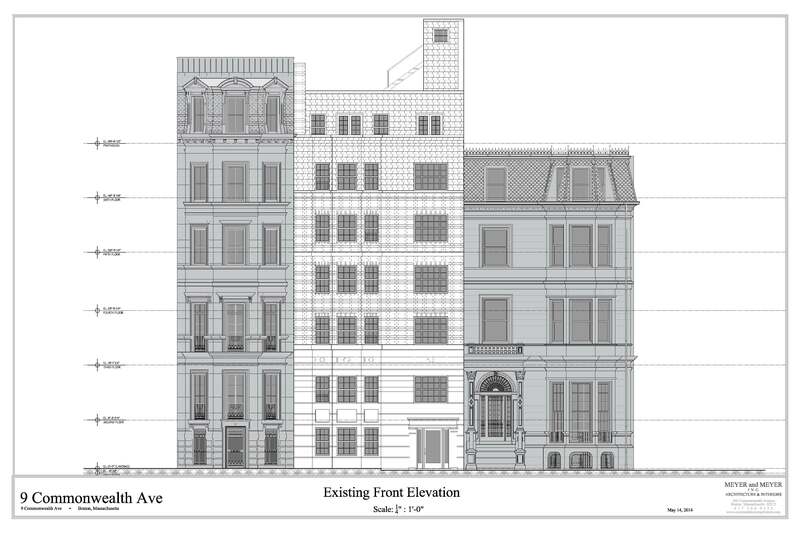 Proposed front façade of 9 Commonwealth, showing abutting buildings, May2014; courtesy of Meyer and Meyer, Inc.